Dallas billionaire Harold Simmons could get a little richer if state lawmakers hand him what he wants today: a bill expanding the right of his company to accept low-level radioactive waste from several states — and the power to set the rates it charges them. Prolific Republican donor and Dallas businessman Harold Simmons, No. 56 on the Forbes list of the richest Americans, could get a little richer if state lawmakers hand him what he wants today: a bill expanding the right of his company to accept low-level radioactive waste from a number of states — and the power to set the rates it charges them. It’s still too early to say what the final legislation will do, but the proposal is headed for debate on the floor of the Texas House today. It has already passed the Senate. Critics say the bill gives too much authority to Simmons, whose wealth was calculated at $5.8 billion by Forbes magazine. The Dallas billionaire has showered campaign contributions on mostly Republican officeholders, from Gov. Rick Perry and Lt. Gov. David Dewhurst on down. He’s also a large contributor to the influential conservative group Texans for Lawsuit Reform. "This is too much, too fast, too soon, if at all,” said Bob Gregory, chief executive of Texas Disposal Systems in Austin and a member of the Texas Low-Level Radioactive Waste Disposal Compact Commission, which administers an agreement between Texas and Vermont, which took effect in Texas in 1993, that ultimately set up the West Texas site to store waste from the two states. Gregory emphasized that he was speaking as an individual and not as a commission member. He added, “I think there should be a process so that rates can be set and there’s a public process and … a full-blown hearing and series of hearings to give people enough time to understand what’s going on here." But Chuck McDonald, a spokesman for Simmons’ Waste Control Specialists, noted the long and arduous process WCS has endured, including the Legislature’s 2003 approval of legislation that paved the way for a private company to operate the facility. He said Simmons has already spent a considerable amount of money to open the facility, which is in Andrews County in far West Texas. McDonald said the WCS facility has been “exponentially more costly” than originally planned. 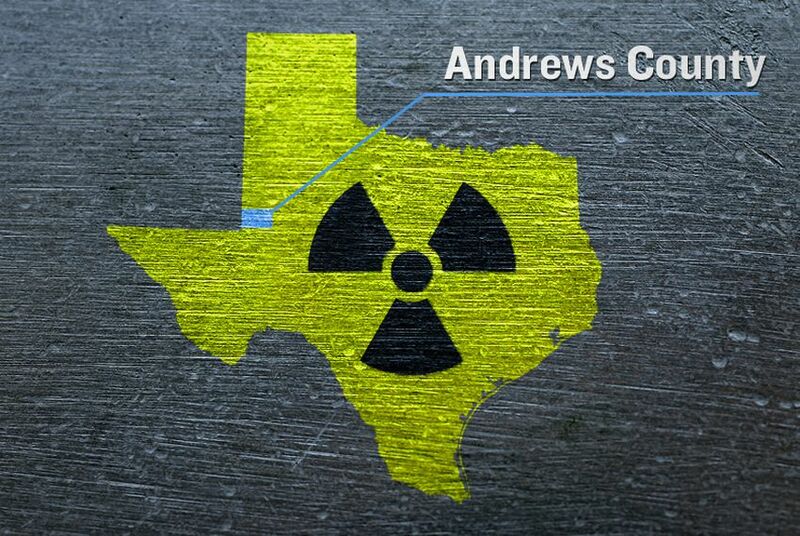 The Andrews County site was originally intended to accept waste from only Texas and Vermont, the two remaining original participants in the compact that began decades ago and is one of several such agreements around the country. States enter the pacts as a way of collectively deciding how to dispose of their low-level radioactive waste. The bill, SB 1504, would codify the ability of Texas to accept waste from 36 states, in addition to Texas and Vermont — a move that is opposed by some environmental groups and Debra Medina, the former Republican gubernatorial candidate. The type of waste the facility would accept ranges from radioactive gloves and rags stacked up in hospital basements to pieces of decommissioned nuclear reactors at the South Texas Project and Comanche Peak nuclear facilities. Currently the waste is stored in a largely ad-hoc manner around the country. Tom "Smitty" Smith, the Texas director of Public Citizen, said that opening the site to the waste from states other than Texas and Vermont could create a capacity problem. "We may not have enough space for our waste — for Texas waste and Vermont waste," he said. Smith also cited concerns over an increased number of trucks carrying hazardous materials on Texas roads, and its potential impact on local groundwater if the wastes migrated. WCS's McDonald said critics vastly overstate the transportation risk, adding that the company got a permit only after extensive geological studies determined no underground water supplies were threatened. “We wouldn’t have gotten the license without that,” he said. Simmons and his family are majority owners in WCS. The company is not mentioned in the legislation but is the sole license-holder for the site in Andrews County. That could make WCS the only private company in the United States with the authority to import class "B" and "C" waste (considered low-level radioactive) from out-of-state generators that haven’t already joined a compact. In other words, Simmons could soon become the biggest private player in low-level "B" and "C" radioactive waste in the country, which means waste that is slightly more hazardous than "A"-level waste that a site in Utah accepts. The rate-setting provision is among the most contentious parts of the legislation. Under the bill, the Texas Commission on Environmental Quality would be able to set rates for waste contributions from Texas and Vermont. But WCS, not the TCEQ, would have the authority to negotiate and set prices for waste accepted from other states. The author of the bill, state Rep. Tryon Lewis, R-Odessa, will offer some language that gives the TCEQ authority to review and approve the rates that WCS sets with companies that import waste, said his legislative director, Bobby Janecka. McDonald, the WCS spokesman, said Texas firms that generate the low-level nuclear waste are guaranteed 56 percent of the space at the facility and that imported waste — meaning from outside the two-state compact — can’t take up more than 30 percent of the total amount disposed. In the meantime, he said, taking out-of-state waste will help lower the cost that Texas companies will ultimately have to pay. The bill would also pave the way for the facility to begin accepting radioactive material before the year ends, but McDonald said that without the legislation, the site could eventually accept far more imported waste. If the bill does not pass, WCS could still accept radioactive waste from states other than Texas and Vermont, but state regulators would set the rates, according to McDonald. Currently there are three active low-level radioactive waste dumps in the country, in Washington state, Utah and South Carolina. However, due to limitations on these sites, the Texas dump would likely become the only site able to accept more hazardous "B" and "C" types of waste from many states, according to Dale Klein, associate director of the Energy Institute at the University of Texas and a former chairman of the federal Nuclear Regulatory Commission. "It could be that unless the [NRC] regulations are changed, then anyone that has "B" and "C" waste, the only option they would have is WCS," Klein said. Andrews County, which stands to gain millions of dollars for its 5 percent cut of the gross receipts, strongly supports the facility. With a proposed 25 percent take for Texas, the state budget would see a $32 million biennial boost for the next two-year budget, according to McDonald, the WCS spokesman. The Harold Simmons Foundation is a $5,000 donor to The Texas Tribune.